Heart rate decelerations and accelerations have unequal input to heart rate variability (HRV) and patterns created by consecutive cardiac cycles—this phenomenon is known as heart rate asymmetry (HRA). The analysis of monotonic runs of heart rate decelerations and accelerations provides a detailed insight into the HRA microstructure and thus of HRV. To evaluate the relation between the severity of obstructive sleep apnea (OSA) and the HRA microstructure during sleep. Seventy-eight patients with suspected OSA underwent overnight polysomnography. The 300-min ECGs from the polysomnography were selected and analyzed. The HRA microstructure was quantified by measuring (1) the contribution of monotonic runs of decelerations or accelerations of different lengths to the number of all sinus beats, and (2) the length of the longest deceleration and acceleration runs. There were 19 patients with no/mild OSA (Apnea/Hypopnea Index (AHI) 5.1 ± 2.5/h), 18 with moderate OSA (AHI 21.8 ± 4.0/h) and 41 with severe OSA (AHI 42.8 ± 17.4/h). 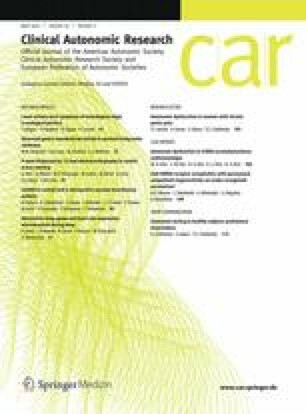 Patients with severe OSA had significantly reduced deceleration and acceleration runs of length 1 compared to the moderate OSA group, and compared to patients with no/mild OSA they had an increased number of longer runs (from 5 to 10 for accelerations and from 5 to 8 for decelerations; p < 0.05 for all comparisons). The longest acceleration runs were significantly longer in severe OSA group (p < 0.05) than in subjects with no/mild OSA. HRA microstructure is related with OSA severity. An increased number of longer deceleration and acceleration runs is more common in severe OSA patients. This study has been supported by an Unrestricted Grant from the Queen’s University Garfield Kelly Cardiovascular Development Fund for the project “Heart rate asymmetry in patients with severe obstructive sleep apnea”. There is no conflict of interest for any of the authors.